Want a sure fire way to impress the love of your life? Cook a sumptuous Valentine’s Day Dinner for them with turkey. Better yet, cook it together! Cooking at home with your sweetie can be more romantic than eating out. You can put on some music, sip a glass of wine, and create something magical. On a more practical side, staying in to cook together saves a ton of money! And, you aren’t stuck with huge restaurant portions that leave you feeling sluggish and ready for a snooze. Cooking at home also let’s you create a meal with nourishing ingredients, including vegetables, whole grains and lean protein foods, like turkey. Turkey is light yet still luscious and packed with satisfying protein to keep you and your love snuggling for hours. Whether you’re planning a romantic evening or a fun-filled family dinner, we have the recipe to suit your needs! Want to linger over dinner with your love? There’s something sensual about creating and sharing a meal together with someone you love. 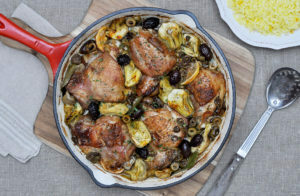 This Spanish Style Braised Turkey Thighs recipe is easy to prepare together. It marinates for a couple of hours and then cooks slowly for an hour, allowing you to enjoy each other’s company while you wait. Watch it, then make it! Our short n’ sweet video shows how simple it is! Good to Know: dark meat (like turkey thighs) is lean and includes even more nutrients – like iron and zinc – than white meat. 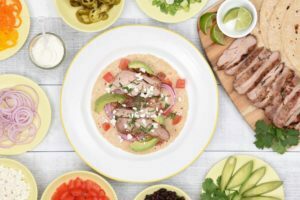 Looking for a quickie meal? Want something gourmet-ish but don’t have a lot of time to cook or linger over dinner? (February 14th falls on a weeknight after all!). 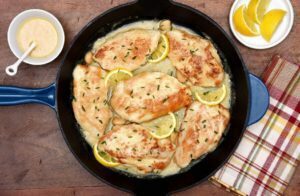 This 5-Ingredient Creamy Lemon Garlic Skillet Turkey is for you! It’s creamy without any cream at all – garlic and olive oil create the simple sauce and the turkey cooks in less than 10 minutes. Watch it, then make it! See how quick it is (the video and the recipe)! Tasty Tip: this skillet turkey would be delicious over lightly sautéed greens or a spinach salad. Leftovers are ideal in sandwiches for lunch the next day. Is Valentine’s Day a family affair in your house? If your kiddies will be sharing this lovely day with you, have some fun with a Family Style Grilled Turkey Taco Bar. The whole family can help get the veggie toppings ready while you grill the turkey. Then you can all sit down together and build your own tacos, just the way you like them! Watch it then make it! Our video shows you how to set up your taco bar. Picky Eater Tip: get your kiddos in the kitchen to help you out. It might slow you down, and there will be a mess, but it’s worth it! Kids who are choosy may be more willing to try a food if they’ve helped make it. Happy Valentines Day! Hope it’s a delicious one.